Pre-Engineering Building Structure can be adapted to suit a wide variety of structural applications, the greatest economy will be realised when utilising standard details. An efficiently designed pre-engineered building can be lighter than the conventional steel buildings by up to 30%. Lighter weight equates to less steel and potential price saving in a structural framework. We specialise in the design, manufacture and erection of pre-engineered metal building systems. The company's market area is nationwide. 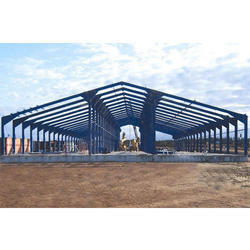 The metal building industry is highly competitive, based primary on price. Pre-engineered buildings are generally low rise buildings however the maximum wave height can go up to 25 to 30 meters. Low rise buildings are ideal for offices, houses, showrooms, shop fronts etc. Buildings can be constructed in less than half the normal time especially when complemented with the other engineered subsystems. Taking the advantage of our manufactured finest grade Civil Contraction Concrete Pre-Engineering Building, we have become the most trusted entity. Acclaimed widely as an economical solution for structural applications, the offered buildings are trusted for its high tensile strength construction. We are partnered with recognised vendor base and procure quality approved grades of steel to develop the frameworks and other components. Owing to the innovative designing software the offered buildings can be made as per the clients’ choice of design and dimensional specifications. 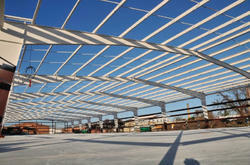 Pre-engineered buildings are factory-built buildings of steel that are shipped to the site and bolted together. What distinguishes them from other buildings is that the contractor also designs the building - a practice called design & build. This style of construction is ideally suited to industrial buildings and warehouses; it is cheap, very fast to erect, and can also be dismantled and moved to another site - more on that later. Looking for Pre- Engineering Buildings ?